I didn’t get along with this book terribly well until the last 1/4th or so. I’ve read others by Gladwell and been quite pleased that I did, but for some reason this one seems different – the last 1/4 excepted. 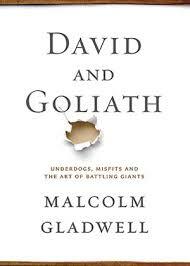 Gladwell’s interpretation of the Biblical David and Goliath story is mostly not different from the way I was ever taught – I don’t think his ideas add anything to the original. He uses quotes from the Bible in later sections, too, but not whole stories. I suppose it’s possible that Goliath had acromegaly, a growth disorder, I’m sure he had a decent reputation as a warrior – acromegaly would probably have prevented that. But the idea that David was using what in many ways was a superior weapon is new to me and worth considering and definitely to Gladwell’s point in some chapters. In the right hands a slingshot can be more deadly than a spear. First chapters? I’m not interested in basketball at all and I don’t care if it is a girl’s team. Next chapters? Education – that’s rather interesting as I was a Kindergarten teacher for many years and loved it. The idea that class size doesn’t matter sounded like balderdash when I first read it. I’ve had up to 35 children in a classroom and as few as 19 or 20 and I had much better results with the 20 than with 35. However, reading further into the chapter the figures Gladwell is talking about are whether 12 is better than 20 and there he says not necessarily. Aha! And I agree. I think optimum is about 20 and it looks like for general purposes Gladwell’s research shows similar feelings among teachers. Generally, 20 kids gets some interaction and productive grouping going, 12 not so much. But a class with 35 5-year olds with one teacher ends up being a lot of discipline and management techniques rather than quality small or whole group instruction. Moving on into the dyslexia section it feels like a replay of Gladwell’s book “Outliers: The Story of Success” (2008) except that these “outliers” also have a handicap of some kind. I know lots of folks at the top started out with difficulties in addition to great drive and/or intelligence. Sometimes it seems it’s a matter of luck as well – luck was a huge element of Outliers. This is an easy read – one day. Overall, I’m not that impressed although some folks might really enjoy the book – especially if they aren’t familiar with Gladwell’s approach. Need to add that the footnotes are at the end of chapters and are lengthy and fairly interesting – and there are end notes at the end of the book which also add interesting and significant details.